A veteran crime reporter, Nick Mullins was no stranger to scenes of violence and loss. He was well practiced at keeping tragedy at arma (TM)s length with a professional detachment - until he was forced to face his own tragedy when a drunk driver took the lives of Nicka (TM)s wife and one of their two daughters, forever shattering his world. Now, with a nine-year-old to raise on his own, Nick struggles to balance single fatherhood with a career that daily puts him into the dark corners of death and justice. When a convicted murderer is dramatically and publicly gunned down with a single bullet to the head in front of a county jailhouse, Nick is immediately dispatched by his newspaper to cover the story, pressing his old police contacts with his usual mix of subtle charm and brazen questioning. But when he realizes that the victim was the subject of one of his old stories, Nick is drawn into the investigation himself. Before long hea (TM)s one step ahead of the cops in the hunt for a cold-blooded killera ]a sniper who has a talent for targeting criminals, and who makes it clear that he has his eye on Nick. With his career, family, and life on the line, Nick plays a delicate and potentially deadly game of cat-and-mouse with the police, the Secret Service, and his editors - all of whom are watching Nicka (TM)s every move as he fights to find the shooter before he strikes again. 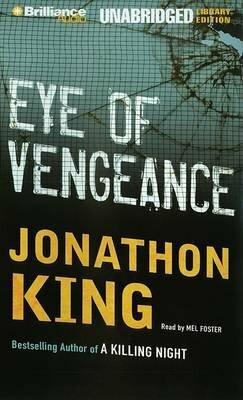 A stirring page-turner bristling with an intense, gritty realism and filled with vivid and unforgettable characters, Eye of Vengeance is Jonathon King at his very best.